Fuenf Schritte zu globalen Bewusstsein und Frieden. The book is available by Amazon as E-Book (Kindle Edition) for 9,15 Euro and in printed version for 16,04 Euro. This link will lead you to buy the book. 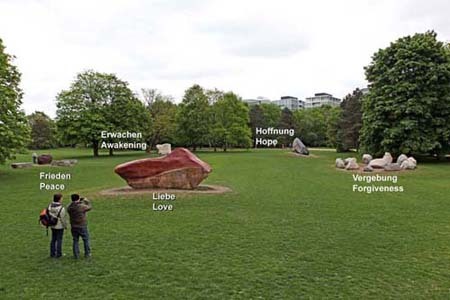 and the other five stones to be placed in Berlin. around the world to meet their sister stones, at high noon in Berlin. Forgiveness, (America) Love, and Australia (Peace). historical, political and ideological burdens as well as commercial interests. It is self-funded, with generous assistance from sponsors along my travels. full documentation of this work, with photos and videos. and unconditional love is my contribution to a better world. 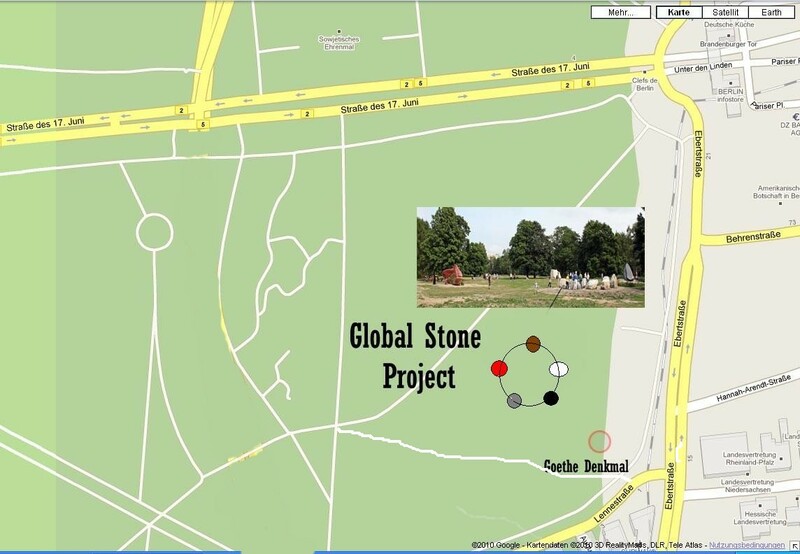 The Global Stone Project consists of ten stones (Stone groups). Five stones are placed in the five continents of origin. The other five stones are placed in a circle in Berlin. Once a year on the 21 st of June the light of the sun connects all ten stones by reflection. lines with his active imagination to creata a circle as a symbol of united mankind. I had been in search of the stones to be included in the Global Stone Project, when I eventually decided to go to the Kingdom of Bhutan. Having received an invitation from the Royal Government, I took a plane from Berlin via Kathmandu to the Land of the Thunder Dragon. Protected by mountains, valleys and canyons the people of Bhutan have been able to preserve their Buddhism-stamped culture. Bhutan at the feet of the highest mountains in the world is a small Kingdom with democratic structures, there I wanted to find the stones which represent Asia and stand for forgiveness. Click here to read the link about the chronology of the venezuelan stone`s problem (in german language). The Research from Prof. Dr. Bruno Illius. You will find the location near the Loewengruppe (Lions Group) in Tiergarten. With the Brandenburger Gate behind you, follow the Ahornsteig for about 300m. Or Potsdamer Platz, enter the Park near Sony Center and keep walking for about 250m. I have sailed around the world in "Pegasus", a three-masted sailboat I built more than 30 years ago. It served as the main tool for the mission I have set myself to pursue. Since the beginning of the "global stone project" a lot of information has been published about it. Just find out which efforts we made and how we solved unexpected problems.